Christine Yurie Kim Eminent Professor of Information Technology and Associate Chair for Graduate Studies K. J. Ray Liu has co-authored a new book titled “Behavior Dynamics in Media-Sharing Social Networks” with his former advisees, ECE alumnae W. Sabrina Lin (Ph.D., EE, ’09) and H. Vicky Zhao (Ph.D., EE, ’04), who is now with the University of Alberta. 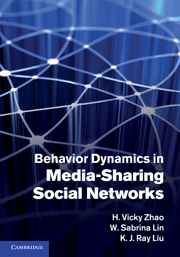 Published by Cambridge University Press, the book demonstrates how game theory can be used to model user dynamics and optimize design of media-sharing networks. The text also investigates the impact of human factors on multimedia design and shows how to improve system performance by modeling and analyzing human behavior using examples from real-world multimedia social networks. As social networks rapidly evolve and millions of users create, share and reuse media content, there are clear challenges in protecting content security and intellectual property, and in designing scalable and reliable networks capable of handling high levels of traffic. This comprehensive resource demonstrates how game theory can be used to model user dynamics and optimize design of media-sharing networks. Combining mathematical tools and engineering concepts with ideas from social sciences and human behavior analyses, this expansive guide enables researchers to explore this emerging field further and ultimately design media-sharing systems more efficiently, securely and with greater opportunity for personalization. For more information about the book, visit the Cambridge University Press website.